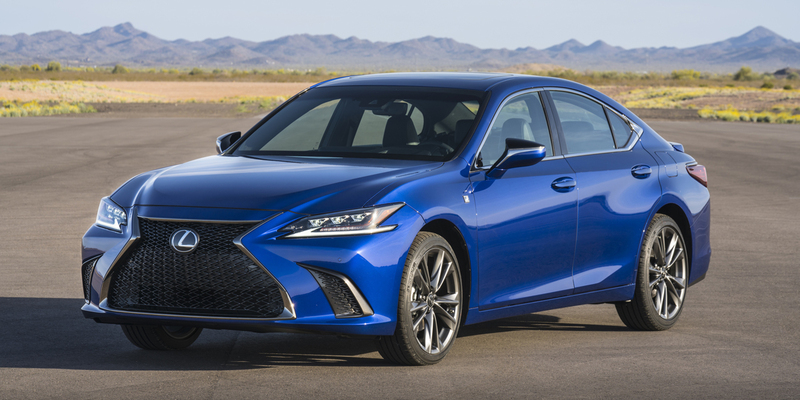 CG Says: The Lexus ES midsize sedan kicks off its seventh generation for 2019; it’s redesigned on a slightly larger new platform, gaining more powerful engines, new technology features, and a sporty F Sport trim level. The ES 350’s engine is still a 3.5-liter V6, but it’s a new design, and horsepower increases from 268 to 302. The previous 6-speed automatic transmission is replaced by an 8-speed automatic. Combined horsepower for the ES 300h hybrid’s 2.5-liter 4-cylinder engine and electric motor is 215—an increase of 15 over the previous-generation model. All ESs are front-wheel drive only; all-wheel drive is not offered. New tech features include Apple CarPlay smartphone connectivity (Android Auto is still conspicuously absent), WiFi hotspot, and Amazon Alexa connectivity. Lane Tracing Assist is a new driver aid that can help keep the ES in its lane by monitoring the road’s lane markings or the path of the preceding vehicle. Automatic rear braking is a new safety feature that works in conjunction with the rear-obstacle detection system. Other safety features include forward collision warning with automatic emergency braking and pedestrian detection, lane-keep assist and lane departure warning, blind-spot monitor, and adaptive cruise control. The Lexus ES has long been one of the cushiest, most serene luxury sedans on the market, but it was never a particularly athletic vehicle. The redesigned 2019 model adds a welcome dose of dynamic capability—particularly in the sporty new F Sport trim level—while maintaining a comfortable, pleasant overall demeanor. We’re still not big fans of Lexus’s Remote Touch infotainment control system, and the lack of Android Auto connectivity and folding rear seatbacks are unfortunate quirks, but this quiet, roomy sedan is still one of the best vehicles in its class—and it’s a great value as well.